What’s more appalling than their sheer number is the realization that I actually use only about seven of these cookbooks. There are some I open on occasion (seeking Father DeWolf’s brisket recipe in Keeping the Feast, say, or the Mediterranean tuna dish in Pasta Fresca) and some that serve as a good reference (the canning process in The Joy of Cooking), but shamefully I’ll admit that there are many from which I’ve never tried a single recipe. Consider the mysterious Treasures of Armenian Cooking. I’ve never been to Armenia, nor has anyone in my family. Moreover, I’d find it difficult to imagine a single culinary specialty that has its origins there. Well, okay, maybe pilaf. But why is Treasures of Armenian Cooking on my shelf? And ditto for The Best of Austrian Cooking. I have actually been to Austria, but only because they wouldn’t let me into Czechoslovakia, and … well, it’s a long story. Let’s just say I wasn’t shopping for cookbooks during the short time I was there. I suppose you could consider the collection to be a sort of chronicle of my development as a cook, or at least a progression of my interests. There’s the Tassajara Bread Book from my college days when I baked shoebox-sized loaves of whole wheat bread and wore Indian print skirts and my hair in a long braid. Or Simply Scones – a bible during my (thankfully) brief stint running a tea room. For many years, the royal family dined well on Pierre Franey’s 60 Minute Gourmet, although spending a whole hour on a single meal now seems like an indescribable luxury. Fast forward to Pretend Soup as the children learned to cook (but not, alas, to clean up). And just recently my professional interests have led me to acquire Victorian Cakes. Don’t ask. Whims are represented in several volumes that obsess on single items: Biscotti … A Passion For Potatoes … Paella! … Cobblers, Crumbles, and Crisps … Wraps… The Totally Pancakes and Waffles Cookbook …Tamales … Cupcakes …Grilled Cheese (50 Recipes to Make You Melt) … and -- count ‘em -- two volumes of The Garlic Lover’s Cookbook. Politics gets its due in 30 Years at the [Arkansas Governor’s] Mansion and the 1887 edition of The White House Cookbook. The latter helpfully includes directions for crafting poultices along with a remedy for boils and a cure for ringworms. There are restaurant cookbooks – Nora, City Restaurant, Coyote Café, China Moon, Rowe’s Family Restaurant, Café Beaujolais, and La Brea Bakery – some of whose recipes require a sous chef, a dishwasher, and a couple of line cooks to pull off. I have several volumes of cookbooks in French. These would be an interesting experiment if one had the time for experimentation, and if one knew how to measure out a hectogram. 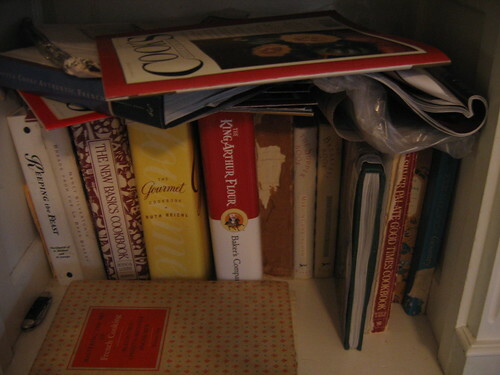 And finally, the cookbooks are supplemented with magazines. Lots of them. Every single issue of Gourmet from 1985 to 2003. Cook’s Illustrated. Saveur. Oh, and a big stack of food sections from the Los Angeles Times that my mother-in-law graciously saves for me each week. So, searching for an idea for this week’s pie, I decided to put one of these forgotten cookbooks to good use. Thus we have Torta di Pere e Mandorle (Pear and Almond Tart) exhumed from Rogers Gray Italian Country Cook Book, a most handsome volume once you remove the layer of dust from the cover. Don’t ask me where the book came from or why, although I imagine it had something to do with a fantasy involving an Italian villa, a warm bowl of tagliatelle, a big bottle of Chianti, and a husky voice murmuring cara mia. Not to mention the King wading through the breakers toting a big halibut. Full disclosure: No one in the royal family went ga-ga over this (although Lucy was not consulted). And this might, perhaps, offer an explanation to the under-utilized quality of the cookbook. Of course we ate it anyway: the filling is both custardy and marzipan-like and the resulting confection is sweet and rich and a little bit chewy. 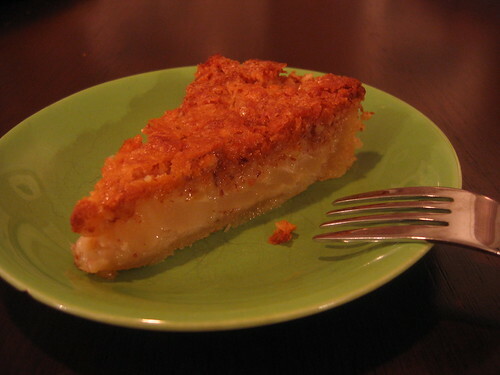 Make tart shell: In food processor, mix together flour, sugar, and salt. Add butter, while pulsing, until mixture resembles coarse crumbs. Continue pulsing and add yolk and water mixture. Form dough into disk and wrap in plastic wrap. Chill at least one hour. Preheat oven to 350. Press pastry into bottom and sides of 10-inch tart pan. Line with parchment paper and pie weights (or beans or ball bearings, I suppose). Bake 20 minutes, or until light brown. Cool. For filling: Cream butter and sugar until mixture is light. 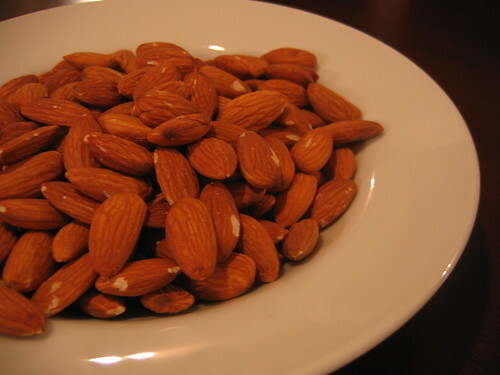 Chop almonds fine in food processor. Add to butter and sugar mixture and mix well. Add eggs. 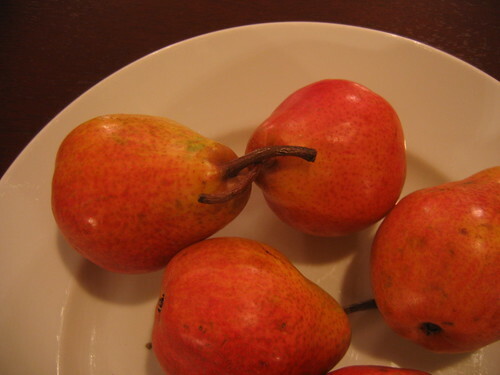 Spoon over pears and bake for 35 minutes (or until filling is puffed and golden brown). Yee-hah! Some people collect travel guidebooks for place they never have been and never will go. I have been known to read a repair manual for a motorcycle I've never owned and never will own. I have an entire shelf of sheet music that I will probably never be able to play unless I practiced on the piano six hours a day seven days a week for the next eight years. And some people collect cookbooks full of recipes the will never make. But here's the thing about cookbooks... You don't necessarily have to cook from them. I rarely follow a recipe. I'm more of an intuitive cook. I look in the fridge. I look in the cupboard. I look at the spice rack. Then I start throwing things toward the stove. And usually the result is edible. But I own some cookbooks. Joy of Cooking. Fanny Farmer. 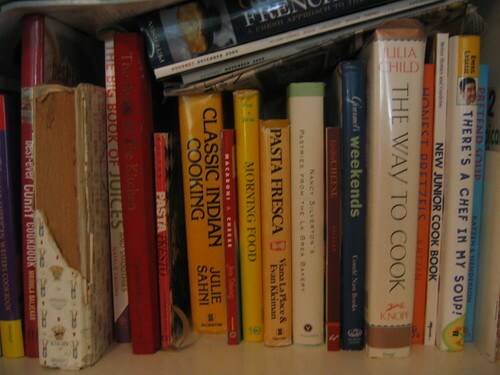 Cooking Secrets of the CIA (that's the Culinary Institute of America), A Higher Taste (the Hare Krishna cookbook), several regional cookbooks, and recent additions have been the Weight Watchers books (ummm... yeah). And I rarely open one in the kitchen. I usually read a cookbook in the living room. I read them. I look for ideas. Oooh, I never thought of combining dill and tarragon. Hmmmm... I'll have to try that on salmon. Even though the recipe I'm reading is for chicken. And I know your highness does the same... nobody ever published a recipe for Samosa Pie before, did they? I look for techniques. Put whole unhusked corn on the grill on low heat, turn it every five minutes or so, and it's done when the outer husks are just turning black. Stick a nice sharp paring knife in about two inches into a lamb roast, then poke a clove of garlic into the hole (okay, I'll admit, I got that from watching Justin Wilson, not a cookbook). We were over at a friend's house a couple weeks ago, and I perused their cookbook shelf. Mostly, they were snooty gourmet titles. But I found a really cool pasta cookbook. I took it into the living room and read it (how horribly anti-social, I know). So, I say keep collecting 'em! Even if they are written in Armenian. By the way, my brother built a little altar to his copy of the Tassajara Bread Book. Thanks for reviving the memory. I noticed in your stack of cookbooks "There's a chef in my soup" by Emeril. I was just reading that he is coming out with a new children's-focused cookbook "There's a chef in my world." Now I know this is not a cookbook reviewing blog, however, I would love to hear if the Princes ever happened to cook from "There's a chef in my soup" and what they thought. 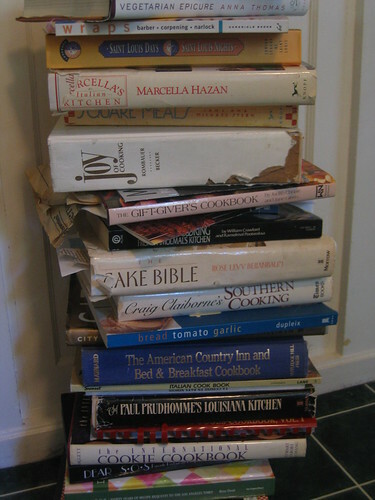 One other question, you mention that you mostly cook from just a handful of cookbooks. I was curious if you wouldn't mind sharing with your faithful readers what they are? We're having company over Saturday night, and I'll peruse the recipes posted thus far. I might make the chocolate silk pie again. The lukewarm reception to this here pie knocks it out of consideration. Hopefully, this week's featured pie will be a Level 1 (novice) pie that I can make. Currydude, Sometimes I'll read cookbooks before bed and then dream of eating good things all night long. I highly recommend it. SoCalSis, The Emeril children's cookbook is an oft-consulted resource of the younger prince. His favorite recipe is a concotion that we've since dubbed "Tater-tot pie." As for me, I find that I'm often consulting the big Gourmet cookbook that was recently published. I've probably made half the recipes in the Fannie Farmer Baking Book and a lot of Lee Bailey's Desserts, too. Mastering the Art of French Cooking is well-thumbed (and autographed!) and the Cafe Beaujolais Cookbook is held together by a rubber band,the residue of many cooking spills, and memories of a honeymoon. sirmarkb, I suggest you try the rustic tarts in "There is No I in Teamwork" or the key lime tartlets in "Tart Tarts." Either would be adaptable for an avowed dough-a-phobe and are tried, true, and tasty, too. I'm all right. buy clomid in the united states http://wiki.answers.com/Q/User:Med-help buy clomid in the united states Good-bye! buy androgel hcg clomid A merry Christmas! Hi! valtrex cost cheap ultram http://www.asianave.com/valtrex-cost/ valtrex cost deine nachricht online site Good luck! I would like to speak to you. valtrex cost http://www.stumbleupon.com/url/tentology.net/buy_valtrex_en-us.html valtrex cost My congratulations to you! Good evening! valtrex cost valtrex cost valtrex cost Happy New Year! 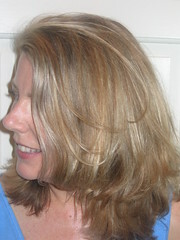 Excuse me... buy clomid http://www.playlist.com/blog/entry/12526097155 buy clomid So long! buy lasix http://www.playlist.com/blog/entry/12530350595 buy lasix Thank you.